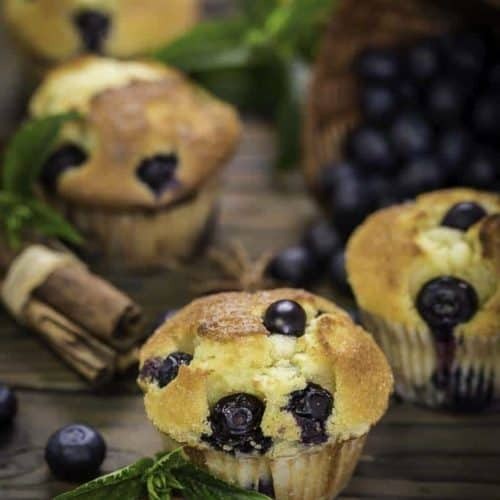 Home » CopyKat Recipes » Magnolia Bakery Blueberry Muffins – make muffins just like they do in the bakery. 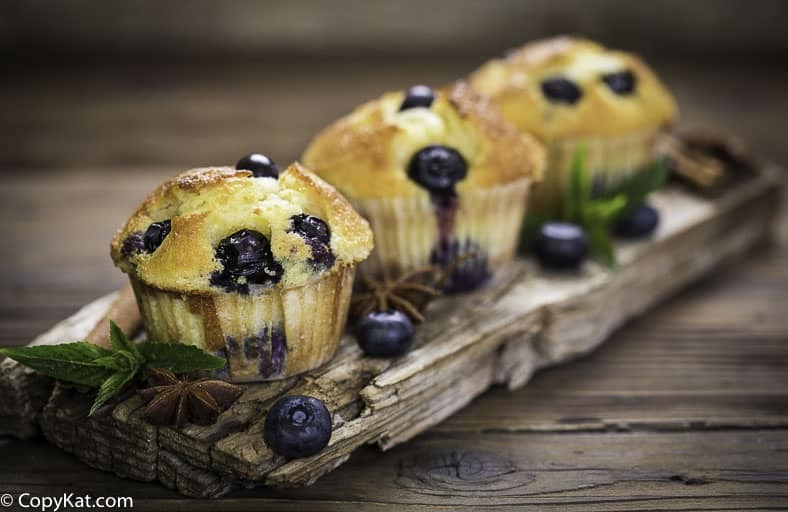 Magnolia Bakery Blueberry Muffins – make muffins just like they do in the bakery. These are wonderful when they come fresh out of the oven. You can find more recipes from the Magnolia Bakery Cookbook. Magnolia Bakery is known for their amazing bakery goods. This chain of bakeries was founded in New York City in the 1990s. Lines form every day when they open their doors. If you are lucky you can go to one of their bakeries and enjoy some of their cakes, cupcakes, and yes, blueberry muffins. What makes a good blueberry muffin? 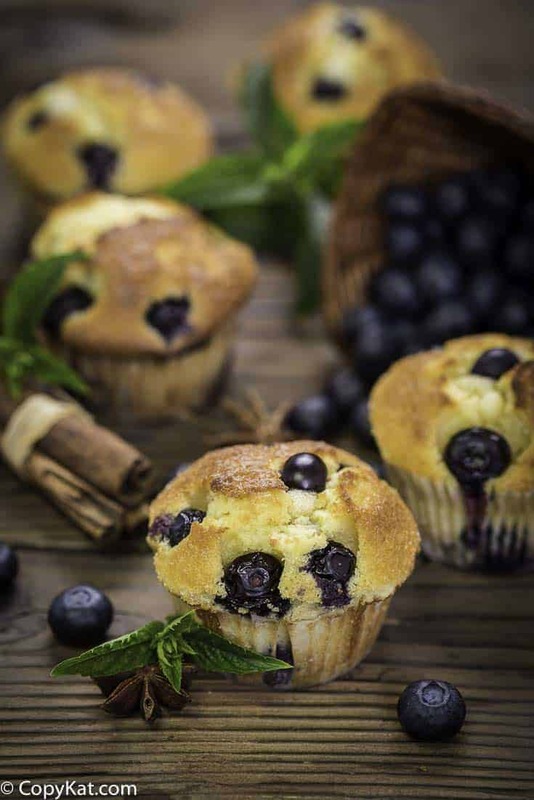 Fresh ingredients and a bit of cooking technique make for tender and flavorful blueberry muffins. Many muffin recipes, you will need to combine your dry ingredients separately from the wet ingredients. When you do combine the dry and the wet ingredients it is important not to overmix the batter. If you overmix the batter the muffins will be tough. Should you use a paper lining when making muffins? It is absolutely not necessary to use a paper lining, but you must be sure to grease the muffin tin well when baking muffins. Yes, paper linings look lovely, and they can help protect the delicate pastry, but if you don’t happen to have any on hand, you can feel comfortable in preparing muffins without paper linings. Love blueberries? Be sure to try some of these blueberry recipes. You can make blueberry muffins just like Magnolia Bakery. Preheat oven to 350 degrees. Grease a 12 cup muffin pan generously. In a large bowl, mix together the dry ingredients, making a well in the center. Stir in the liquid ingredients until just combined, being careful not to over mix. The batter may be lumpy. Gently fold in the blueberries into the batter. Fill the muffin cups about three-quarters full. Lightly sprinkle with the remaining 1 tablespoon of sugar. Bake for 35 to 40 minutes until lightly golden or a cake tester inserted into the center of the muffin comes out with moist crumbs attached. Do not over bake. Please correct instructions – the recipe makes 24 muffins, not 12. Also, cook time is misquoted. At 22 minutes, muffins were barely stable. Golden brown took approximately 8 – 10 minutes more. Thanks I will retest the recipe, and make an update. Didn’t care for this recipe. Eggy taste to the muffin and no other flavor stood out. This recipe did not work for me either. Took 38 minutes to cook through, never really turned brown though. Batter is dense and not sweet at all. I made this exact recipe from the Magnolia House Bakery cookbook and they were moist and tasty, but the batter itself was slightly bland. I think next time I might add a bit of lemon zest or cinnamon to the batter for a bit more flavor. I made these muffins today and was very disappointed. The recipe says not to over bake them but they still took twice as long to bake and still came out with no color and tasting like a biscuit. I did not want to make scones I wanted muffins. Not a good recipe in general. I am really sorry these didn’t work out for you. They are good, one thought that I have may have been your baking powder may have been inactive. It sounds like they didn’t lift like they should have. The levening agents in here would have been the baking powder, eggs, and the buttermilk. It sounds like something wasn’t as active as it should have been.